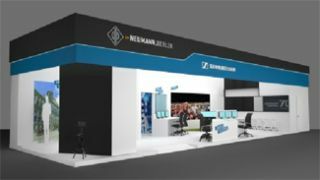 Sennheiser and Neumann will exhibit together at IBC in Dubai, previewing four showcases that together provide a complete overview of the two audio companies’ solutions — a new wireless product, a typical radio station environment, a TV broadcast studio, and a dedicated sports broadcasting set up. The Electronic News Gathering (ENG) world in the companies' exhibit will show the full scope of typical electronic newsgathering situations, from high-end broadcasting teams to small video crews and one-man shows. For expert broadcasting teams, wireless microphone systems for camera use from Sennheiser’s 5000, 3000, and 2000 series will be on show. “For this segment, we will preview a stunning new wireless product at IBC,” said Anders Laybourn, marketing manager, Sennheiser Broadcast & Media. For mobile journalism, Sennheiser will showcase its most portable ENG audio solutions, the ClipMic digital and MKE 2 digital clip-on microphones, which connect directly to iPhone, iPad, or iPod touch devices, turning them into an ENG tool that is always at hand. The clip-on mics were developed in cooperation with A/D conversion specialists Apogee Electronics. A typical radio station set-up will offer demonstrations of Neumann’s BCM 104, TLM 102, and TLM 107 radio microphones, as well as the U 87 model as an additional heritage exhibit. Sennheiser HD 26 Pro and HD 650 headphones and Neumann KH 120 monitor speakers as well as a Neumann KH 810 subwoofer round out the studio recreation. A typical TV talkshow ‘studio’ and control room serve to showcase the highest-quality Sennheiser and Neumann broadcast equipment, from Digital 9000, Sennheiser’s digital wireless system, to Neumann KH 310 monitor speakers. Wired microphones for studio use, such as the table-top Sennheiser MKH 8050 and ME 36 models, as well as the Neumann KM 185 and Sennheiser broadcast headsets, will also be part of the display. For presenters, the studio environment features the classic MKE 40 clip-on mic and the new Headmic 1, which was recently launched at InfoComm in June. “Sports broadcasting is an area that drives many innovations in the broadcasting segment, therefore it is given a special focus within our IBC presence,” said Laybourn. The highlight will be Esfera, Sennheiser’s surround sound system, which creates a fully fledged 5.1 sound from a two-channel signal. Mounted onto a camera or installed in a stadium, the compact Esfera microphone can be operated just like any rugged stereo microphone, whose sound can then be converted to 5.1 at any point in the workflow.